Despite having been used widely for over 15 years, carboplatin and similar drugs continue to inspire quite a bit of scientific research. Report on four-drug combination therapy success. A microdosing approach for characterizing formation and repair of carboplatin-DNA monoadducts and chemoresistance. Vorinostat increases carboplatin and paclitaxel activity in non-small-cell lung cancer cells. Subconjunctival nanoparticle carboplatin in the treatment of murine retinoblastoma. Does weight matter in determining dosage? 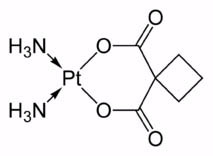 Tumor platinum concentration following intraperitoneal administration of cisplatin versus carboplatin in an ovarian cancer model. Does a nanomolecule of Carboplatin injected periocularly help in attaining higher intravitreal concentrations? Combined weekly carboplatin and paclitaxel as primary treatment of advanced epithelial ovarian carcinoma. Cisplatin- versus carboplatin-based chemotherapy in first-line treatment of advanced non-small-cell lung cancer: an individual patient data meta-analysis.